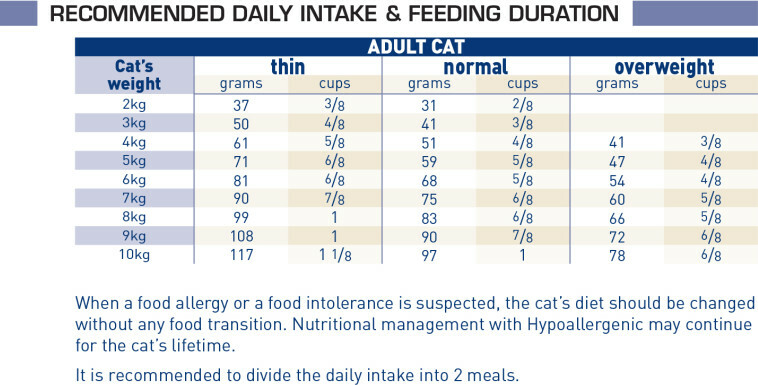 Hypoallergenic For cats with Adverse Food Reactions (AFR), food allergy, food intolerance, with dermatological and/or gastro-intestinal signs, food elimination trial, Inflammatory Bowel Disease (IBD), chronic diarrhoea, small intestinal bacterial overgrowth (SIBO), Exocrine Pancreatic Insufficinecy (EPI). Soy protein isolate digest is composed of low molecular weight peptides, so is highly digestible and of very low allergenicity. Very high amounts of biotin niacin and pantothenic acid, in combination with the zinc-linoleic acid complex, reduce water losses through the skin and strengthen the barrier effect of the skin. Eicosapentaenoic and docosahexenoic acids, omega-3 long chain fatty acids, modulate skin reactions and contribute to the intestinal mucosal integrity. Rice, hydrolysed soya protein isolate, animal fats, vegetable fibres, minerals, hydrolysed poultry liver, soya oil, beet pulp, fish oil, Fructo-Oligo- Saccharides (FOS), borage oil, marigold extract (source of lutein). Crude ash: 6.3%. Crude fibre: 3.6%. Crude oil fats: 20%. Moisture: 5.5%. Protein: 25.5%. Vitamin A: 25300IU, Vitamin D3: 800IU, E1 (Iron): 41mg, E2 (Iodine): 3mg, E4 (Copper): 10mg, E5 (Manganese): 55mg, E6 (Zinc): 206mg. Preservatives - Antioxidants.